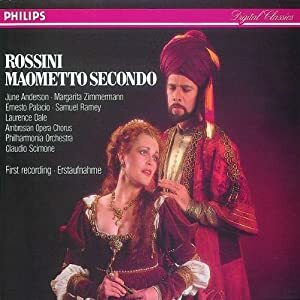 Maometto II, opera in two acts, premiered in Naples (Teatro di San Carlo) on December 3, 1820, and rewritten with many changes for La Fenice in Venice in December 1822. The present version is the Neapolitan version, under the critical edition prepared by Hans Schevellis, edited by Philip Gossett. Sung in Italian, with individual English or Spanish Opera Titles available in front of each seat. Maometto II will be getting a brand new, historically important production in Santa Fe, featuring for the first time ever the brand new Critical Edition prepared by Dutch scholar Hans Schellevis. This version hasn't even been published yet, and is scheduled to appear in print in 2013, edited by musicologist Phillip Gossett, who is advising the production team in Santa Fe and will be present during rehearsals.